What do you think of these roping horse pictures? The speed, rope skill, accuracy, and timing as well as cooperation from your 1000lb equine partner make this a challenging western rodeo sport. and tie its feet together with one coil of rope. The rider who is successful with the fastest time and least amount of time penalties wins. Penalties are incurred if the calf struggles free before six seconds of being tied. These pictures both show the cowboy headed after the calf before he has thrown the rope. If he is successful, then the other rider will attempt to rope the back legs. 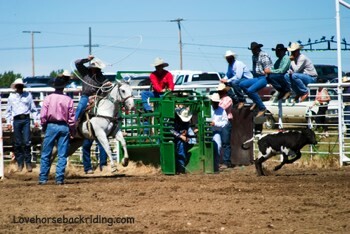 This rider is called the heeler. He must capture both legs. If he doesn't, the team gets a 5 second penalty. The team finishes when both ropes are taut. Check out the United States Team Roping Championship Page for more information. The resounding favorite breed used in these western sports is the American Quarter Horse. Catch some of your own fun by looking at more pictures and learning about riding by leaving roping horse pictures and going back to the home page.